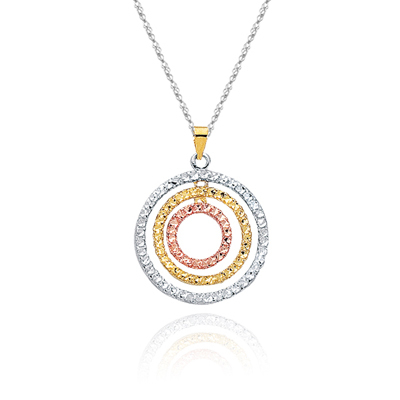 Diamond-Cut Geometric Circle Pendant in 14K Three Tone Gold . 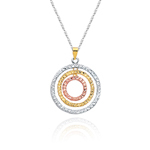 This fascinating Three Tone Gold Geometric Circle Pendant exhibits mesmerizing circles in 14K White, Yellow and Pink Gold. The pendant comes finished with an 18-inch 14K White Gold Singapore Chain. Wear this spectacular pendant to rock the world.